I love the dollar store, in particular Dollar Tree, and you’d be amazed at some of the stuff you can find for crafts and home décor projects. I was happy to join in with my friend Rachael’s (blogger over at This Is Our Bliss) My Dollar Store DIY challenge because I really love showcasing how you can do a lot for a little bit of money. 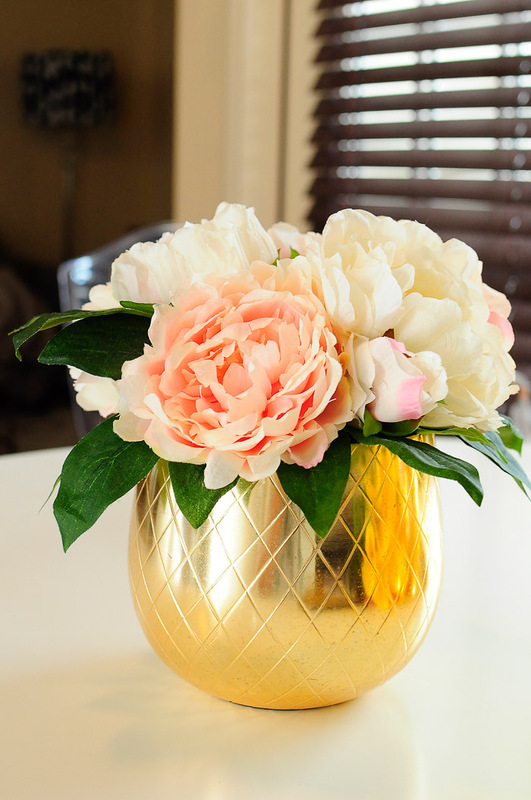 As much as I’d love to have real florals all over my home, they can get pricey and the selection isn’t so great around here, so I do rely on faux florals quite a bit. I tend to buy floral bunches in the $10-$20 range in white/ivory/neutral colors from places like Pier 1 Imports, World Market, Michael’s and Hobby Lobby. The problem is come spring and summer, I really want lots of bold florals in my home, so that’s where dollar store flowers can really come in handy. 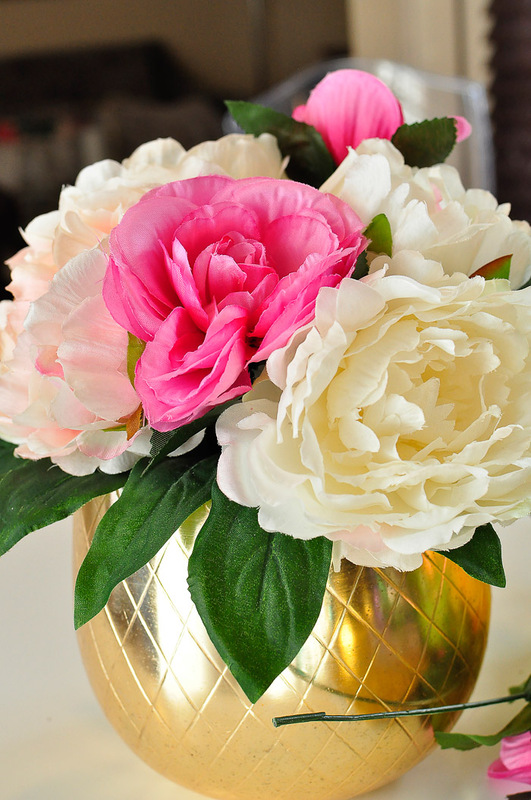 You can easily change up a white faux floral arrangement by adding in some colorful and seasonal stems. For now, I’m opting for hot pink and yellow, and in the holiday seasobn I could easily add glittery pinecones and other decorative floral picks. 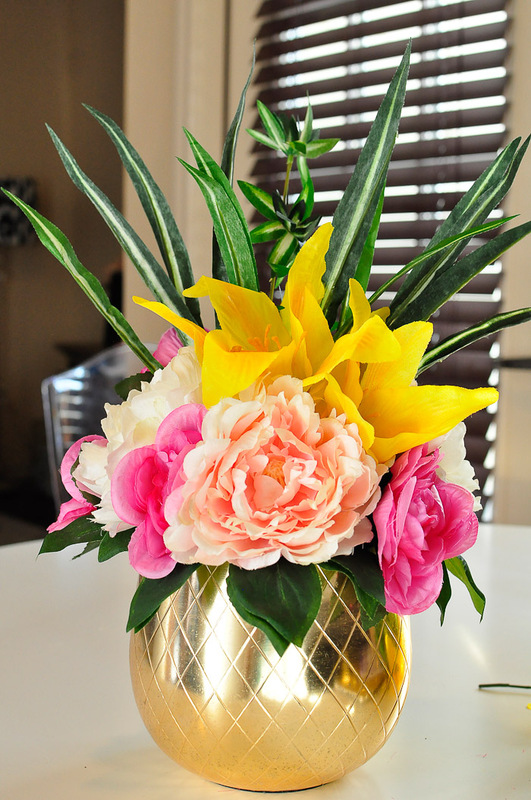 For this project, I spent $3 since I already had the pineapple ice bucket (from HomeGoods) and the peony floral bouquet (Pier 1 Imports). Dollar Tree has a TON of luau themed supplies right now, including plastic pineapple tumblers that could easily be spray painted gold for the same look I have going on here. They also have some faux hydrangeas that could easily replace the faux peonies I am using, so even if you had to buy everything it’d be about $5-$7. I didn’t need floral foam for this project—all I used was scissors to trim each flower to create individual stems. I’m all about quick and simple projects after a long day at work. I placed the bouquet in the ice bucket—rather than trim the bouquet to fit, I lightly bent the bottom of the stems to fit. Then I layered in some of the pink flowers. And finally added height and flair with some greenery. 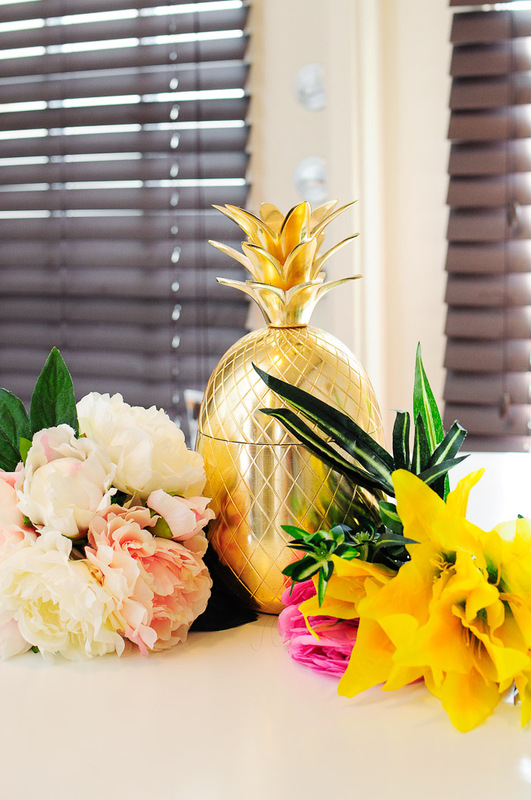 Totally tropical, easy and simply gorgeous on my bar cart in my foyer. The gold really makes the colors pop. 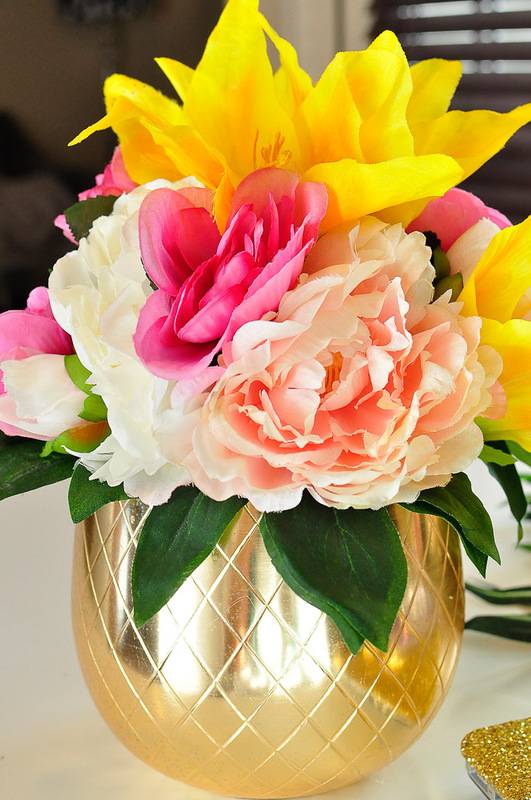 There’s a few other bloggers who created floral craft projects that would be perfect for your home or spring décor. See their projects below! I just love the pineapples!! They are everywhere, which makes the flowers it just pop!! So cute! I soooo love this! You made their flowers look like a million bucks! I saw Dollar Tree's luau themed decor and definitely spotted the pineapples. I see another trip in my future because now I'm having regrets ha! 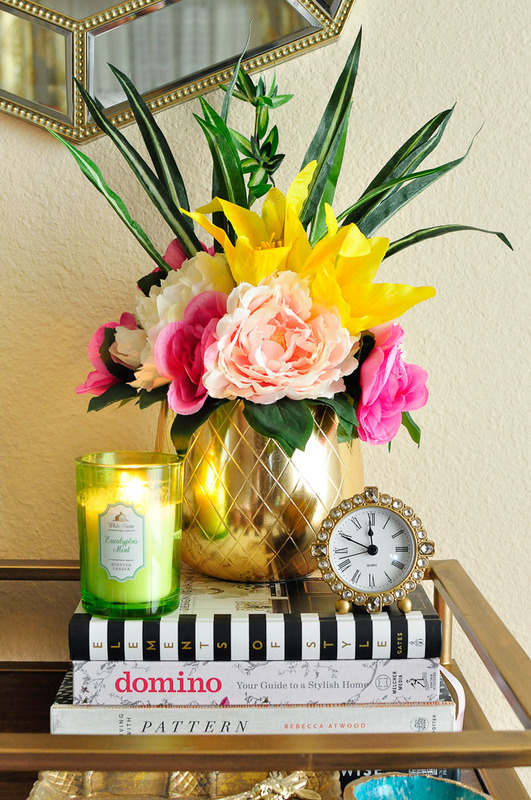 Love your gorgeous vignette, Monica!! This looks fantastic, Dollar Tree is my go to store too. Can't beat the price on those flowers. Pretty and fresh for spring! Love it. Mixing the old and new makes it really nice and that pineapple is SO gorgeous!